The song thrush (Turdus philomelos) is a thrush that breeds across much of Eurasia. It has brown upperparts and black-spotted cream or buff underparts and has three recognised subspecies. Its distinctive song, which has repeated musical phrases, has frequently been referred to in poetry. The song thrush builds a neat mud-lined cup nest in a bush or tree and lays four to five dark-spotted blue eggs. It is omnivorous and has the habit of using a favourite stone as an "anvil" on which to break open the shells of snails. Like other perching birds (passerines), it is affected by external and internal parasites and is vulnerable to predation by cats and birds of prey. The song thrush was described by German ornithologist Christian Ludwig Brehm in 1831, and still bears its original scientific name, Turdus philomelos. The generic name, Turdus, is the Latin for thrush, and the specific epithet refers to a character in Greek mythology, Philomela, who had her tongue cut out, but was changed into a singing bird. Her name is derived from the Ancient Greek Φιλο philo- (loving), and μέλος melos (song). The dialect names throstle and mavis both mean thrush, being related to the German drossel and French mauvis respectively. Throstle dates back to at least the fourteenth century and was used by Chaucer in the Parliament of Fowls. Mavis is derived via Middle English mavys and Old French mauvis from Middle Breton milhuyt meaning "thrush." Mavis (Μαβής) can also mean "purple" in Greek. 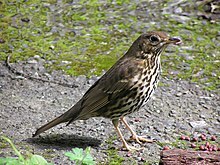 A molecular study indicated that the song thrush's closest relatives are the similarly plumaged mistle thrush (T. viscivorus) and Chinese thrush (T. mupinensis); these three species are early offshoots from the Eurasian lineage of Turdus thrushes after they spread north from Africa. They are less closely related to other European thrush species such as the blackbird (T. merula) which are descended from ancestors that had colonised the Caribbean islands from Africa and subsequently reached Europe from there. T. p. clarkei, described by German zoologist Ernst Hartert in 1909, and named for William Eagle Clarke, breeds in the rest of Great Britain and Ireland and on mainland Europe in France, Belgium, the Netherlands and possibly somewhat further east. It has brown upperparts which are warmer in tone than those of the nominate form, an olive-tinged rump and rich yellow background colour to the underparts. It is a partial migrant with some birds wintering in southern France and Iberia. This form intergrades with the nominate subspecies in central Europe, and with T. p. hebridensis in the Inner Hebrides and western Scotland, and in these areas birds show intermediate characteristics. Additional subspecies, such as T. p. nataliae of Siberia, proposed by the Russian Sergei Buturlin in 1929, are not widely accepted. The song thrush (as represented by the nominate subspecies T. p. philomelos) is 20 to 23.5 centimetres (8 to 9.25 in) in length and weighs 50–107 grammes (1.8 to 3.8 oz). The sexes are similar, with plain brown backs and neatly black-spotted cream or yellow-buff underparts, becoming paler on the belly. The underwing is warm yellow, the bill is yellowish and the legs and feet are pink. 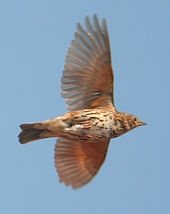 The upperparts of this species become colder in tone from west to east across the breeding range from Sweden to Siberia. The juvenile resembles the adult, but has buff or orange streaks on the back and wing coverts. The song thrush breeds in most of Europe (although not in the greater part of Iberia, lowland Italy or southern Greece), and across the Ukraine and Russia almost to Lake Baikal. It reaches to 75°N in Norway, but only to about 60°N in Siberia. Birds from Scandinavia, Eastern Europe and Russia winter around the Mediterranean, North Africa and the Middle East, but only some of the birds in the milder west of the breeding range leave their breeding areas. In Great Britain song thrushes are commonly found where there are trees and bushes. Such areas include parks, gardens, coniferous and deciduous woodland and hedgerows. 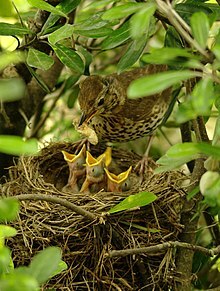 The female song thrush builds a neat cup-shaped nest lined with mud and dry grass in a bush, tree or creeper, or, in the case of the Hebridean subspecies, on the ground. She lays four or five bright glossy blue eggs which are lightly spotted with black or purple; they are typically 2.7 cm × 2.0 cm (1.06 in × 0.79 in) size and weigh 6.0 g (0.21 oz), of which 6% is shell. The female incubates the eggs alone for 10–17 days, and after hatching a similar time elapses until the young fledge. Two or three broods in a year is normal, although only one may be raised in the north of the range. On average, 54.6% of British juveniles survive the first year of life, and the adult annual survival rate is 62.2%. The typical lifespan is three years, but the maximum recorded age is 10 years 8 months. The song thrush is occasionally a host of parasitic cuckoos, such as the common cuckoo, but this is very rare because the thrush recognizes the cuckoo's non-mimetic eggs. 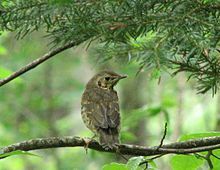 However, the song thrush does not demonstrate the same aggression toward the adult cuckoo that is shown by the blackbird. The introduced birds in New Zealand, where the cuckoo does not occur, have, over the past 130 years, retained the ability to recognise and reject non-mimetic eggs. Land snails are an especially important food item when drought or hard weather makes it hard to find other food. The thrush often uses a favourite stone as an "anvil" on which to break the shell of the snail before extracting the soft body and invariably wiping it on the ground before consumption. Young birds initially flick objects and attempt to play with them until they learn to use anvils as tools to smash snails. The nestlings are mainly fed on animal food such as worms, slugs, snails and insect larvae. In the western Palaearctic, there is evidence of population decline, but at a level below the threshold required for global conservation concern (i.e., a reduction in numbers of more than 30% in ten years or three generations) and the IUCN Red List categorises this species as of "Least Concern". In Great Britain and the Netherlands, there has been a more than 50% decline in population, and the song thrush is included in regional Red Lists. The decreases are greatest in farmlands (73% since the mid-1970s) and believed to be due to changes in agricultural practices in recent decades. The precise reasons for the decline are not known but may be related to the loss of hedgerows, a move to sowing crops in autumn rather than spring, and possibly the increased use of pesticides. These changes may have reduced the availability of food and of nest sites. In gardens, the use of poison bait to control slugs and snails may pose a threat. 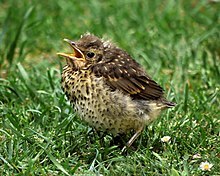 In urban areas, some thrushes are killed while using the hard surface of roads to smash snails. Thrushes have been trapped for food from as far back as 12,000 years ago and an early reference is found in the Odyssey: "Then, as doves or thrushes beating their spread wings against some snare rigged up in thickets—flying in for a cozy nest but a grisly bed receives them." Hunting continues today around the Mediterranean, but is not believed to be a major factor in this species' decline in parts of its range. ^ a b c BirdLife International (2012). "Turdus philomelos". IUCN Red List of Threatened Species. Version 2013.2. International Union for Conservation of Nature. Retrieved 26 November 2013. ^ Brehm, Christian (1831). Handbuch der Naturgeschichte aller Vogel Deutschlands (in German). p. 382. ^ a b c "Song Thrush Turdus philomelos [CL Brehm, 1831 ]". BTO Birdfacts. British Trust for Ornithology. Retrieved 2008-01-25. ^ The Chambers Dictionary (2006). Chambers. pp. 195, 1581. ISBN 0-550-10185-3. ^ The American Heritage Dictionary of the English Language. Houghton Mifflin Company. 1973. p. 808. ^ Greek. Lonely Planet. 2006. p. 244. ISBN 1-74059-140-2. ^ Voelker G, Rohwer S, Bowie RCK, Outlaw DC (2007). "Molecular systematics of a speciose, cosmopolitan songbird genus: Defining the limits of, and relationships among, the Turdus thrushes". Molecular Phylogenetics and Evolution. 42 (2): 422–434. doi:10.1016/j.ympev.2006.07.016. PMID 16971142. ^ a b c d e f g h i j k l m n o p q r s Clement, Peter; Hathway, Ren; Wilczur, Jan (2000). Thrushes (Helm Identification Guides). Christopher Helm Publishers Ltd. pp. 392–395. ISBN 0-7136-3940-7. ^ Brackenbury, J. H. (1979). "Power capabilities of the avian sound-producing system" (PDF). J. Exp. Biol. 78 (1): 163–166. ^ Devoogd, Timothy J.; John R. Krebs; Susan D. Healy; Andy Purvis (1993). "Relations between Song Repertoire Size and the Volume of Brain Nuclei Related to Song: Comparative Evolutionary Analyses amongst Oscine Birds". Proceedings: Biological Sciences. 254 (1340): 75–82. doi:10.1098/rspb.1993.0129. PMID 8290611. ^ Slater, Peter J. B. (1983). "The Buzby phenomenon: Thrushes and telephones". Animal Behaviour. 31: 308–309. doi:10.1016/S0003-3472(83)80204-8. ^ Holden, Peter (2012). RSPB Handbook Of British Birds. p. 228. ISBN 978 1 4081 2735 3. ^ "'BIRDS', from An Encyclopaedia of New Zealand, edited by A. H. McLintock, originally published in 1966". Te Ara – The Encyclopedia of New Zealand, updated 18-Sep-2007. Ministry for Culture and Heritage / Te Manatū Taonga. Retrieved 2008-03-13. ^ Heather, B.; Robertson, H. (1996). The Field Guide to the Birds of New Zealand. Auckland: Viking. pp. 384–385. ISBN 0-670-89370-6. ^ "Song thrush (Turdus philomelos)". Birds. Department of Agriculture, Western Australia. Archived from the original on 2007-12-08. Retrieved 2008-01-25. ^ "The State of Our Invertebrate Animals". State of New Zealand's Environment 1997, Chapter 9. Ministry for the Environment, New Zealand. Archived from the original on 2008-06-17. Retrieved 2008-03-13. ^ "Song thrush (Turdus philomelos)". Department of Agriculture and Food Western Australia. Archived from the original on 2007-12-08. Retrieved 2008-03-13. ^ "The State of Our Indigenous Birds" (PDF). The State of Our Biodiversity – The State of New Zealand's Environment. Ministry for the Environment, New Zealand. Archived from the original (PDF) on 2015-01-24. Retrieved 2008-03-13. ^ Mason, Christopher F. (1998). "Habitats of the Song Thrush Turdus philomelos in a largely arable landscape". Journal of Zoology. 244: 89–93. doi:10.1111/j.1469-7998.1998.tb00010.x. ^ Davies, N. B. (March 2002). "Cuckoo tricks with eggs and chicks". British Birds. 95 (3): 101–115. ^ Grim, Tomáŝ; Honza, Marcel (2001). "Differences in behaviour of closely related thrushes (Turdus philomelos and T. merula) to experimental parasitism by the common cuckoo Cuculus canorus" (PDF). Biologia, Bratislava. 56 (5): 549–556. Archived from the original (PDF) on 2017-08-09. Retrieved 2018-09-09. ^ Hale, Katrina; Briskie, James V. (March 2007). "Response of introduced European birds in New Zealand to experimental brood parasitism". Journal of Avian Biology. 38 (2): 198–204. doi:10.1111/j.0908-8857.2007.03734.x. ^ Brown, Roy. "A Review of the impact of Mammalian Predators on Farm Songbird Population Dynamics" (PDF). Songbird Survival. Archived from the original (PDF) on July 2, 2007. Retrieved 2008-01-27. ^ "Song thrush". Birds and wildlife. RSPB. Retrieved 2008-01-27. ^ a b "Song thrush – Turdus philomelos". The Royal Horticultural Society/The Wildlife Trusts. Archived from the original on 2013-05-20. Retrieved 2012-04-09. ^ Martil, S. Cano; Caballero, E.J. López; del Valle Portilla, María T (2000). "Estudio con microscopia electrónica de barrido de adultos de Splendidofilaria (Avifilaria) Mavis (Leiper, 1909) Anderson, 1961". Revista biologia (in Spanish). 14 (1). ^ Palinauskas, Vaidas; Markovets, Mikhail Yu; Kosarev, Vladislav V; Efremov, Vladislav D; Sokolov Leonid V; Valkiûnas, Gediminas (2005). "Occurrence of avian haematozoa in Ekaterinburg and Irkutsk districts of Russia" (PDF). Ekologija. 4: 8–12. Archived from the original (PDF) on 2009-03-26. ^ Kipp, Susanne; Goedecke, Andreas; Dorn, Wolfram; Wilske, Bettina; VolkeFingerle (May 2006). "Role of birds in Thuringia, Germany, in the natural cycle of Borrelia burgdorferi sensu lato, the Lyme disease spirochaete". International Journal of Medical Microbiology. 296: 125–128. doi:10.1016/j.ijmm.2006.01.001. PMID 16530003. ^ Comstedt, Pär; Bergström, Sven; Olsen, Björn; Garpmo, Ulf; Marjavaara, Lisette; Mejlon, Hans; Barbour, Alan G.; Bunikis, Jonas (July 2006). "Migratory Passerine Birds as Reservoirs of Lyme Borreliosis in Europe" (PDF). Emerging Infectious Diseases. 12 (7): 1087–1094. doi:10.3201/eid1207.060127. PMC 3291064. PMID 16836825. ^ Henty, C. J. (1986). "Development of snail-smashing by song thrushes". British Birds. 79: 277–281. ^ Goodhart, C. B. (May 1958). "Thrush Predation on the Snail Cepaea hortensis". The Journal of Animal Ecology. 27 (1): 47–57. doi:10.2307/2173. JSTOR 2173. ^ Owen, Denis F.; Bengtson, Sven-Axel (1972). "Polymorphism in the Land Snail Cepaea Hortensis in Iceland". Oikos. 23 (2): 218–225. doi:10.2307/3543409. JSTOR 3543409. ^ "Song Thrush Turdus philomelos". Breeding Birds in the Wider Countryside. British Trust for Ornithology/Joint Nature Conservation Committee. Retrieved 2008-01-27. ^ "Song Thrush (Turdus philomelos)". Species Action Plan. UK Biodiversity Action Plan. Archived from the original on 2008-04-15. Retrieved 2008-03-11. ^ Erritzoe, Johannes; Mazgajski, Tomasz D.; Rejt, Łukasz (2003). "Bird casualties on European roads — a review" (PDF). Acta Ornithol. 38 (2): 77–93. doi:10.3161/068.038.0204. ^ "Home Thoughts, from Abroad". Englishverse.com. Retrieved 2008-01-26. ^ Stallings, A. E. "The Darkling Thrush: A Centennial Appreciation". Archived from the original on May 19, 2008. Retrieved 2008-03-11. ^ "Thrushes". Poems by Ted Hughes. Poemhunter. Retrieved 2008-03-11. ^ "The Tables Turned". William Wordsworth: Complete Poetical Works. bartleby.com. Retrieved 2008-01-29. ^ McOwan, Gavin (2002). The Essential History of West Bromwich Albion. Headline. p. 15. ISBN 0-7553-1146-9. ^ Bocheñski, Z.; Tomek, T. (2004). "Bird remains from a rock-shelter in Krucza Skala (Central Poland)" (PDF). Acta zooologica cracoviensia. 47 (1–2): 27–47. ^ Homer; Fagles, Robert (translator) (1997). The Odyssey. New York: Penguin Books. p. 453. ISBN 0-14-026886-3. ^ Las Provincias (14 December 2006). "Un entramado para cazar tordos" (in Spanish). ^ Europa Press. "El Tribunal de la UE condena a España por permitir la caza con 'parany' en la Comunidad Valenciana" (in Spanish). Archived from the original on 2008-06-14. ^ Dyson, C. E. (1889). Bird-Keeping – A Practical Guide for the Management of Singing and Cage Birds. Frederick Warne and co. p. 51. Wikimedia Commons has media related to Turdus philomelos. This page was last edited on 14 April 2019, at 17:38 (UTC).